Do you believe on this proverb "The best things in life are free"? If you ask me, yes I DO!! Now, if someone will give you a free luxury hotel accommodation to one of the best vacations spots in the world, would you believe and take it? For sure 95% of you reading this will say "it's a scam" etc etc. Let me tell you a story of how I was able to crossout one of my bucketlist a.k.a dream vacation. I never actually thought it was a destination I wanted to visit for some factors. Going back, I was strolling beach side of Boracay in October 2016 on our Day 2. 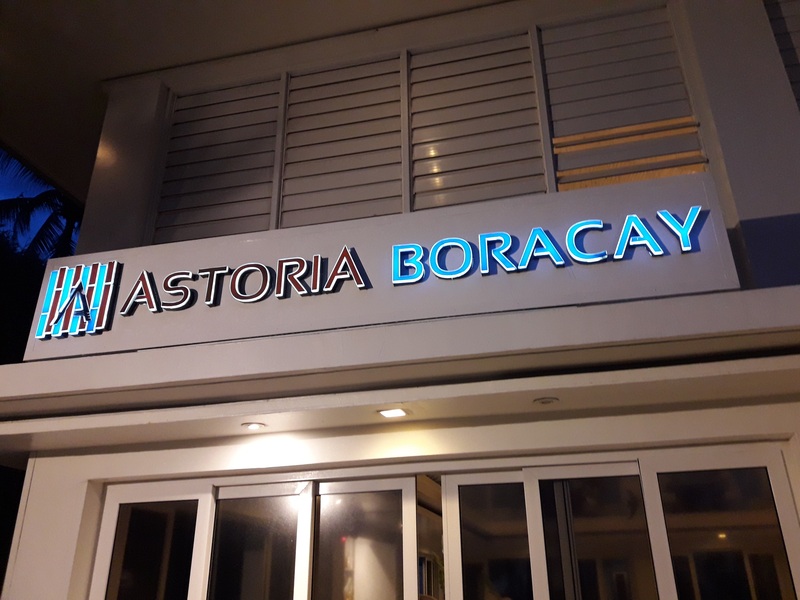 We were approached by a uniformed personnel of one of Boracay's prime hotel (Astoria), asking us if we were invited already for complimentary dinner buffet and a "short" presenation of their hotel's membership. My friend and I agreed to accept the invitation since that will save us dinner for that night, second - we wanted to kill time while waiting for happy hour. The food was delectable! Here's my plate from that night. Food served was superb as if you were a paying customer. My favorites from the selections were the clam chowder soup (real and big clams), beef broccoli and their garden salad. After our sumptuous dinner, we were transferred to their new hotel located in Station 3 (Astoria Current). After quick tour on their new Boracay hotel, we were taken to a function room for the product presentation. I enjoyed it however the rates were not reasonable for us as we have monthly obligations. Maybe after 5 years, we can consider. They gave us gift certificate (3 days 2 nights complimentary accommodation) in return. Here's the gift certificate. We had until December 20, 2016 to avail it. Six locations - Bali caught my eye. My friend allowed me to use it with my boyfriend since she can't take any vacation soon due to personal reasons. We contacted Astoria via phone on November 3, 2016, they asked for my email address to send the details on how to avail voucher. November 3, 2016 : Astoria VLCI 1st correspondence - stating terms and conditions, process of GC availment. November 9, 2016 : I sent my Gift certificate via email. November 10, 2016 : Astoria VLCI acknowledged receiving my GC, they send me the booking form to fill up of our travel dates and location. (see image below) - our preferred travel date was January 26, 2017. November 15, 2016 : Astoria VLCI advised us they found a hotel for us at Kuta, Bali, Indonesia. We just have to pay additional PhP 900 to cover breakfast for 3 days and 2 nights (good for 2 pax and buffet breakfast). They also made an offer of discounted room rate if we want to extend our stay. We chose to directly book instead, hotel had a better package and pay when we arrive. We were given until November 25, 2016 to settle Booking fee (which is fully refundable upon return and proof of stay). Reason for the booking fee is to ensure you will arrive on your booked dates, some customers were "NO SHOW" causing loss of income for the hotel and accommodate guests who are sure to arrive. November 21, 2016 : My boyfriend and I booked our tickets. November 23, 2016 : We deposited PhP 5,000 on their bank account for the booking fee (securing our travel dates). November 25, 2016 : We received (via email) our reservation form for our review. We sent it back within the day. November 29, 2016 : They have confirmed our booking is already FINAL and we can prooced to book our flights if we haven't done yet. From that moment, we can no longer reschedule as this will invalidate our GC and also cannot refund the booking fee. February 8, 2017 : I email Astoria VLCI for refund request together pictures (as proof of stay) and short testimonial of our over-all stay. 3 hours after they acknowledge and endorsed to another person/department for refund process. I was advised the processing time is within fourteen (14) working days. They will let me know once it is refunded back. February 14, 2017 : Email received from Astoria VLCI that they have successfully deposited my refund with picture of deposit slip. My Bali vacation lasted for 10 days. It was so far one of the best vacation I had. If I didn't believe and try it, I may not be able to see my "Gomeybear" and spent time together. Truly thankful to Astoria VCLI for the no hassle transaction. I am one of the living proofs of their "Complimentary stay" by attending their Boracay's product presentation on their membership. Oh by the way, when we were in Bali, we had another GC of hotel accommodation (what a blessing). This one is 7 days in one of their luxury Royal Karma hotels (our choices are Bravia, Germany; Phuket & Chang Mai, Thailand, Bali; Indonesia; Da Nang, Vietnam; and Normande & des Deux Amants France). It has two year expiration. Guess which location we chose this time? Find out on my next blog in the coming months. For my Bali vacation, read my blog Save it for Bali.